The Dining Room in the Nintendo 3DS remake. 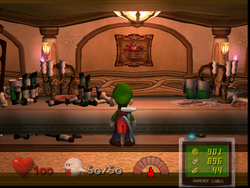 The Dining Room is one of the rooms encountered in Area Two of Luigi's Mansion. To gain entry to the Dining Room, Luigi uses the Key from the Conservatory. After entering, Luigi vacuums up several banana peels with his Poltergust 3000. He then finds Mr. Luggs, who is eating at the table. 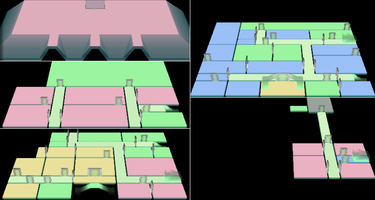 After Luigi captures Mr. Luggs, the lights come on and a treasure chest with money and a Silver Diamond inside appears. The Dining Room is a largely symmetrical room, with the long table in the center flanked by two china cabinets and two torches. There is a Speedy Spirit hiding in the left china cabinet. Additionally, a cheese containing a Gold Mouse is under a chair next to Mr. Luggs. This page was last edited on September 19, 2018, at 21:23.